Download the pdf version of this leaflet here. Chronic pain can have a big impact on day-to-day life – relationships, daily activities, sleep, employment and all aspects of general health can be affected. These changes cause emotional strain on top of the pain. 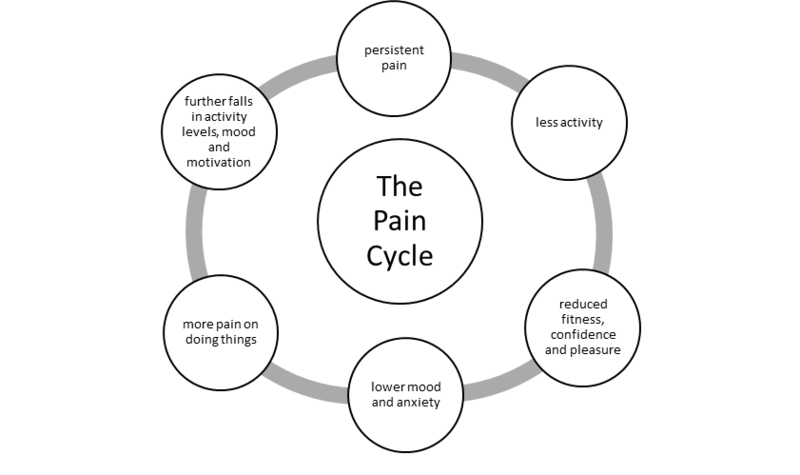 Many people experience a ‘vicious cycle’ which can make pain harder to deal with. 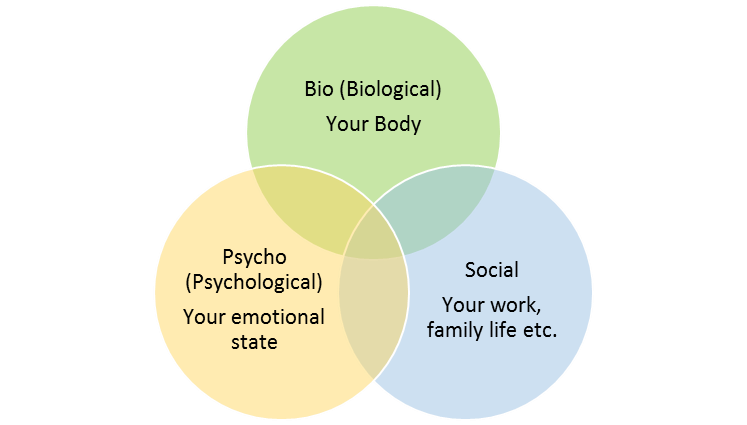 The biopsychosocial model recognises that all three areas interact in our overall experience of pain. Why do they want to talk about how I am feeling? Why are they asking me about my life? Why won’t they focus on my pain? It does not mean they are not interested in the physical aspects of your condition. Looking at the full picture of your pain and all the areas that could be contributing to it, including your emotional wellbeing, could mean that they are better able to help you as a ‘whole person’ – putting together the different parts of the jigsaw puzzle! How might chronic pain make me feel? So I get the idea pain can affect my mood – so what? People in pain often talk about ‘carrying on regardless’ or ‘pushing through’ and may feel like ignoring difficult emotions is the best approach. However, recognising some of the negative feelings and thoughts you may experience can be very helpful in managing your pain in the long term. The close links between the centres of pain and emotion in the brain make it almost impossible to have pain without having negative emotions as well. Recognising the emotional impact of chronic pain can be a first step towards being able to manage both pain and emotions better. This might include becoming more active, eating well, developing a better sleep routine, flare-up planning and looking after your general health (See Pain Concern’s booklet A Guide to Managing Pain. Don’t stop doing things you enjoy – positive activity helps improve brain chemistry! When you are feeling low you might not feel motivated to do the things that you usually enjoy like spending time with family and friends and other social activities. However, avoiding enjoyable things can further entrench negative feelings. Try to keep doing the things you enjoy and spending time with the people you care about however discouraged you feel. Be aware that when you are feeling low things often seem worse than they are. You might be reacting to things in a way that would seem disproportionate to the problem if you were feeling a bit more positive. When you are faced with a problem that is affecting your mood, consciously take a step back. Considering problems ‘from a distance’ should help keep things in perspective. Do the best you can today and give yourself a HUGE pat on the back! Instead of keeping a pain diary what about making time every day to log an entry in a journal for ‘My Achievements’. Make sure you give yourself the credit you deserve. Very often the same patterns make us come unstuck. Look at what led up to the way you are feeling. Is there something (not necessarily the pain itself) that always triggers stress, upset etc.? How you react to things and what you say to yourself can trigger upset in the same way as the pain can. Is there a way to prepare yourself better if you know a trigger is coming up? Watch out for how thoughts affect your state of mind. Be kind to yourself! Simply becoming more aware of what you are saying to yourself can be helpful. It allows you to step back and see thoughts for what they are – just thoughts. Could you learn to give yourself the support you would give to a close friend? Recognising and celebrating even small successes, gently encouraging yourself when the going gets tough. To manage the intensity of pain we need a team of people around us who we can call on for support – family, friends, colleagues or neighbours. Who could you turn to on a really bad day? Try a support group for people in pain in your local area. Consider a Cognitive behaviour therapy (CBT) support course, helping you to make positive changes to the way that you think. Courses can be taken online (www.llttf.com) or possibly in your local community. Improving your mood is not a cure for chronic pain. Managing thoughts and feelings can be difficult and you may have to work on it for a while before you see any benefits. However, eventually, feeling more positive may reduce the pain and the amount of suffering associated with it. David Craig is Consultant Psychologist at NHS Greater Glasgow & Clyde. Katy Gordon is Pain Concern’s Research Officer. Thanks go to the people living with pain and healthcare professionals who advised us on the content of this leaflet. This leaflet has been produced with the support of the Health and Social Care Alliance. Managing emotions ©David Craig and Katy Gordon. All rights reserved. Edited by Tom Green. September 2015. To be reviewed September 2018.